In the spring of 2013, the jihadis were defeated by an international coalition led by French paratroopers, but the women of Mali are only beginning to tell their stories. To survive in the harsh cultural and spiritual desert of archaic rule, many hid in their homes for months on end, or fled to the relative safety of the country’s south. But many also found ingenious ways to fight back. 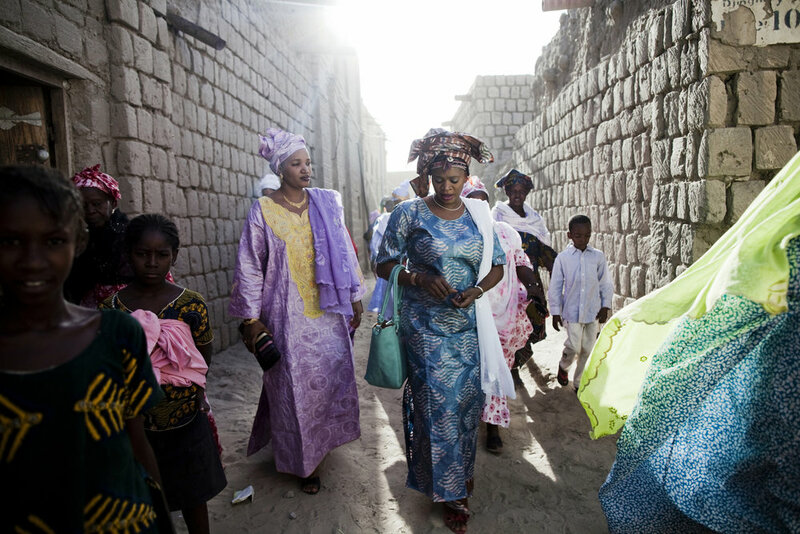 Through small acts of defiance, and determined ingenuity, the women of Timbuktu stood up to the militants’ demands, and kept the unique spirit of their country alive. 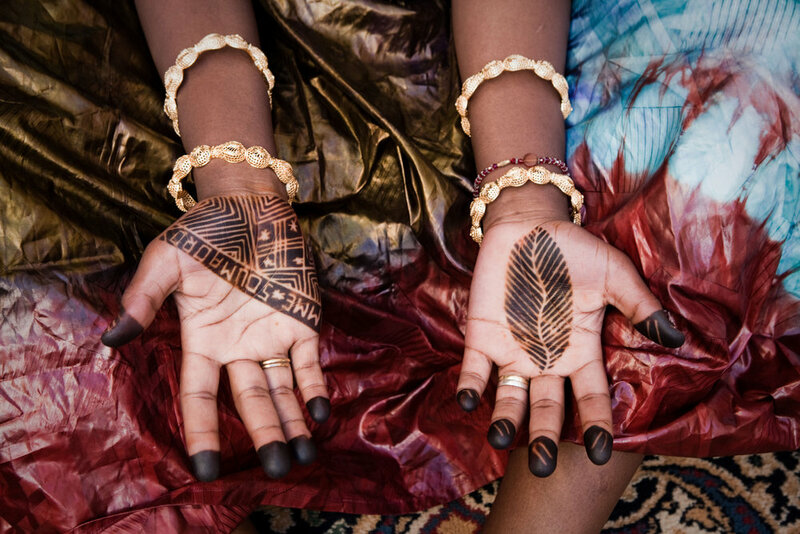 While the north of Mali still remains a semblance of its former self, the resilience of the country’s women who refused to shed their colorful and brash personalities, remains a point of pride. Bamako, Mali. SEPTEMBER 2013. 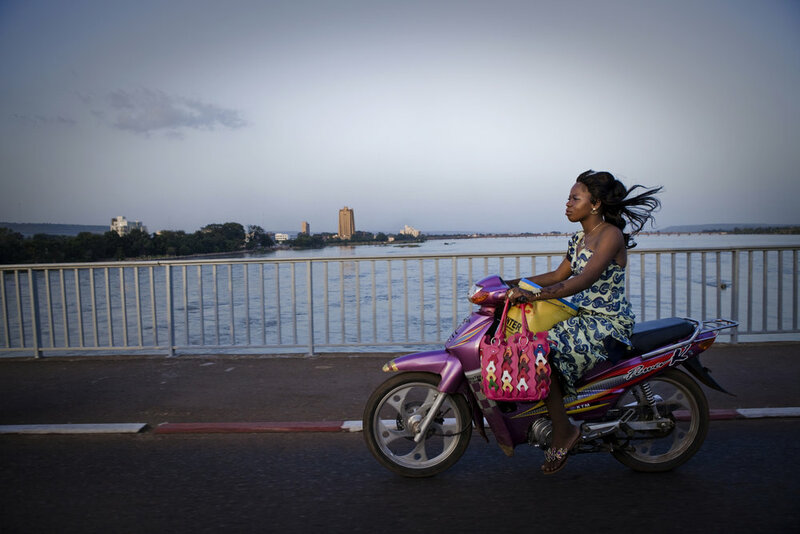 A woman rides her motorcycle across the Niger River in Bamako, Mali. Summary: Mali, a predominantly Muslim country, has been known for it�s vibrant culture, rich ancient Islamic history, religious tolerance and joyful music and dance. Yet much of this culture was at risk of permanent destruction when militant Islamist rebels took over Northern Mali in 2012. The rebels imposed their own despotic version of religious Islamic law and women bore the brunt of the crackdown. Many women fled, while some remained in the confines of their homes for over a year. In the spring of 2013 the French army entered Mali and defeated the Islamist militias. Photo by Katie Orlinsky. TIMBUKTU, Mali. OCTOBER 2013. Tires outside a home in Timbuktu, Mali, meant to protect against flooding. Timbuktu and much of Mali's northern towns still suffer from a lack of power, resources and food. Summary: Mali, a predominantly Muslim country, has been known for it�s vibrant culture, rich ancient Islamic history, religious tolerance and joyful music and dance. Yet much of this culture was at risk of permanent destruction when militant Islamist rebels took over Northern Mali in 2012. The rebels imposed their own despotic version of religious Islamic law and women bore the brunt of the crackdown. Many women fled, while some remained in the confines of their homes for over a year. In the spring of 2013 the French army entered Mali and defeated the Islamist militias. Photo by Katie Orlinsky. Bamako, Mali. SEPTEMBER 2013. Madame Gassamba, 55, and her family in Bamako, Mali. 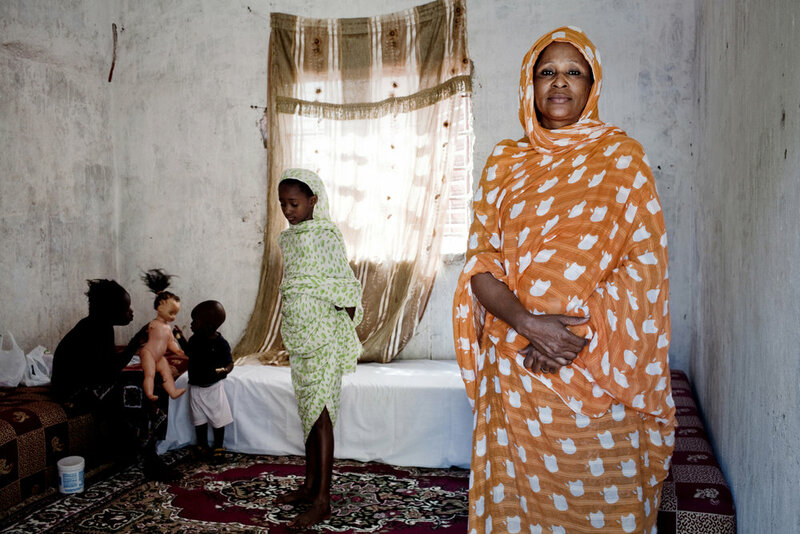 The Gassamba family lives in a one-room house in Bamako after they were forced to flee Timbuktu during the conflict. �We left in a bug bus filled with people�there were one week old babies on the bus,� recalls Gassamba. �Before 2012 there were no problems, the NGOs were there, we worked, we got paid,� recalls Gassamba. �Then they cut off the life of Timbuktu. Women were raped, forced into marriages�we could not go out, we had to cover up, to wear the burka completely [closed].� Life also became expensive, ��If you sell in the market, you couldn't do it, because you couldn't leave the house, you couldn't use your hands, if a hand was seen you� d get hit and put in prison.� Madame Gassamba returns to Timbuktu frequently where she is an active defender of women's rights, but will still not allow her daughters to return home out of fear for their safety. One of her teenage daughters was arrested during the occupation for not covering her hair while doing laundry outside. The girl was put in prison for four days. Gassamba says �she suffered a lot, got sick, and to this day, she feels bad, like she did something wrong, like it was her fault�� Gassamba blames �the bandits,� not her daughter. �Would a real Islamist ever burn a Koran?� she asks. Summary: Mali, a predominantly Muslim country, has been known for it�s vibrant culture, rich ancient Islamic history, religious tolerance and joyful music and dance. Yet much of this culture was at risk of permanent destruction when militant Islamist rebels took over Northern Mali in 2012. The rebels imposed their own despotic version of religious Islamic law and women bore the brunt of the crackdown. Many women fled, while some remained in the confines of their homes for over a year. In the spring of 2013 the French army entered Mali and defeated the Islamist militias. Photo by Katie Orlinsky. 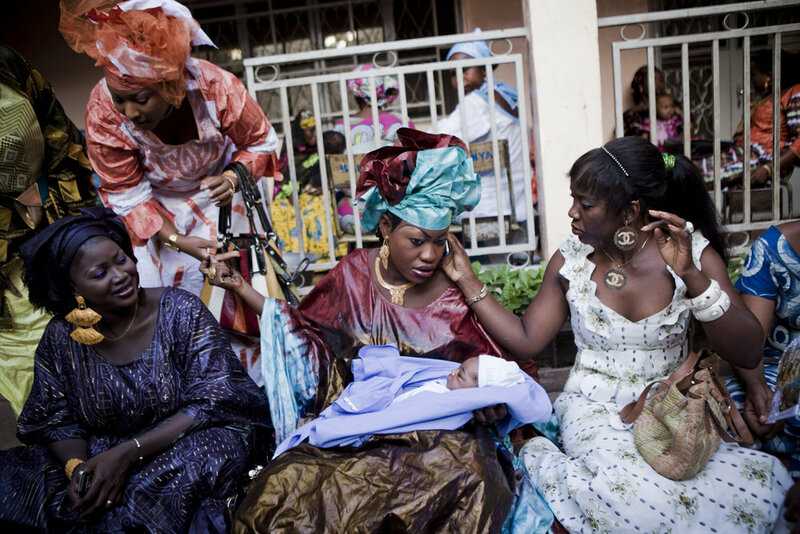 Women gather in the streets of Timbuktu, Mali on a Sunday afternoon to celebrate a three day wedding. by Katie Orlinsky. TIMBUKTU, Mali. OCTOBER 2013. Girls play basketball in downtown Timbuktu, Mali, as part of the Academie de Basket coached by El Hadj Adjanga, a 54-year-old local butcher. "I can tell you this..the first week after liberation -- as soon as they could do it -- the kids were back here playing," he said. In the early days of the Jihadist occupation of Timbuktu, these girls would cover up in the face-concealing niqabs and full-length burkas as demanded, wear it while walking to the courts, and then just take them off and play. Eventually, the situation grew too dangerous to even stay in Timbuktu, and most of the young women fled for Bamako, returning just recently. Summary: Mali, a predominantly Muslim country, has been known for it�s vibrant culture, rich ancient Islamic history, religious tolerance and joyful music and dance. Yet much of this culture was at risk of permanent destruction when militant Islamist rebels took over Northern Mali in 2012. The rebels imposed their own despotic version of religious Islamic law and women bore the brunt of the crackdown. Many women fled, while some remained in the confines of their homes for over a year. In the spring of 2013 the French army entered Mali and defeated the Islamist militias. Photo by Katie Orlinsky. Bamako, Mali. SEPTEMBER 2013. An outdoor hair salon in a shack in Bamako, Mali. Summary: Mali, a predominantly Muslim country, has been known for it�s vibrant culture, rich ancient Islamic history, religious tolerance and joyful music and dance. Yet much of this culture was at risk of permanent destruction when militant Islamist rebels took over Northern Mali in 2012. The rebels imposed their own despotic version of religious Islamic law and women bore the brunt of the crackdown. Many women fled, while some remained in the confines of their homes for over a year. In the spring of 2013 the French army entered Mali and defeated the Islamist militias. Photo by Katie Orlinsky. TIMBUKTU, Mali. OCTOBER 2013. 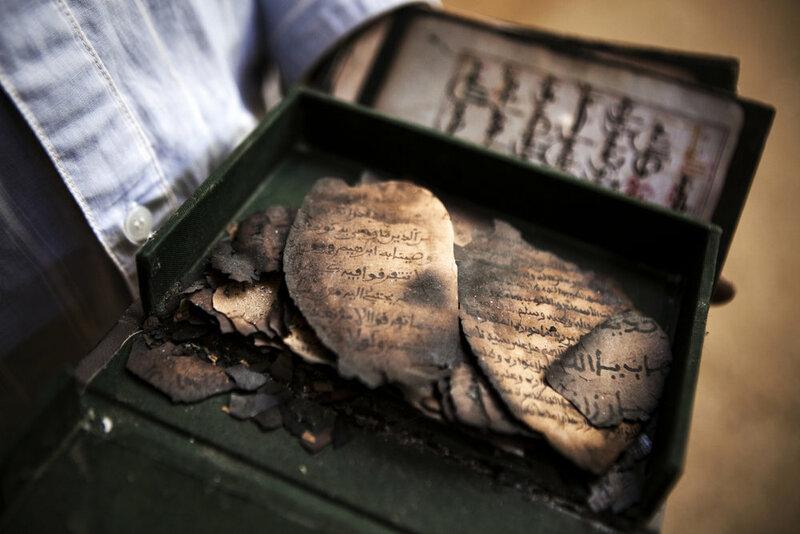 The remains of destroyed manuscripts at the Ahmed Baba Institute of Higher Learning and Islamic Research in Timbuktu, Mali. The institute was home to thousands of manuscripts that were destroyed by Jihadists, who used it as their barracks during the 2012 occupation. Summary: Mali, a predominantly Muslim country, has been known for it�s vibrant culture, rich ancient Islamic history, religious tolerance and joyful music and dance. Yet much of this culture was at risk of permanent destruction when militant Islamist rebels took over Northern Mali in 2012. The rebels imposed their own despotic version of religious Islamic law and women bore the brunt of the crackdown. Many women fled, while some remained in the confines of their homes for over a year. In the spring of 2013 the French army entered Mali and defeated the Islamist militias. Photo by Katie Orlinsky. 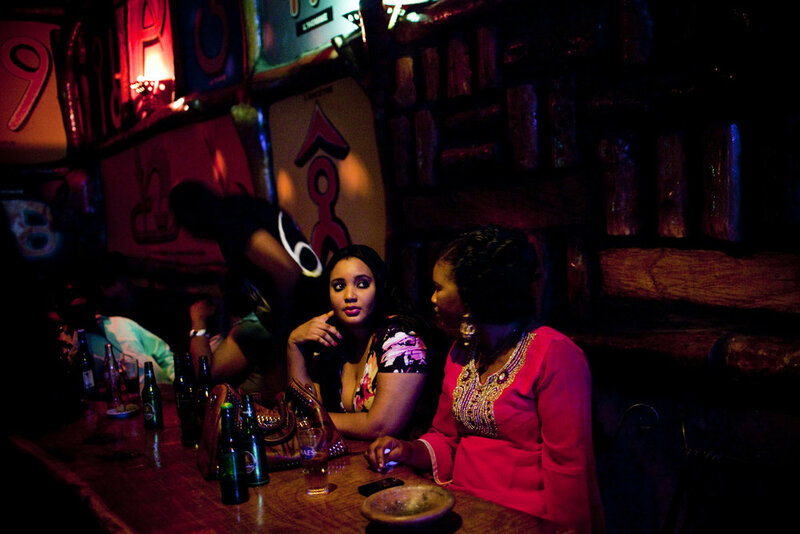 Women at a bar in Bamako, Mali. A combination of fear after the 2012 conflict and a a rising conservative Islamist wave in Malian society has led to the shuttering of many establishments that serve alcohol, even in the capital. Summary: Mali, a predominantly Muslim country, has been known for it�s vibrant culture, rich ancient Islamic history, religious tolerance and joyful music and dance. Yet much of this culture was at risk of permanent destruction when militant Islamist rebels took over Northern Mali in 2012. The rebels imposed their own despotic version of religious Islamic law and women bore the brunt of the crackdown. Many women fled, while some remained in the confines of their homes for over a year. In the spring of 2013 the French army entered Mali and defeated the Islamist militias. Photo by Katie Orlinsky. TIMBUKTU, Mali. OCTOBER 2013. Night falls in Timbuktu, Mali. Summary: Mali, a predominantly Muslim country, has been known for it�s vibrant culture, rich ancient Islamic history, religious tolerance and joyful music and dance. Yet much of this culture was at risk of permanent destruction when militant Islamist rebels took over Northern Mali in 2012. The rebels imposed their own despotic version of religious Islamic law and women bore the brunt of the crackdown. Many women fled, while some remained in the confines of their homes for over a year. In the spring of 2013 the French army entered Mali and defeated the Islamist militias. Photo by Katie Orlinsky. Bamako, Mali. SEPTEMBER 2013. 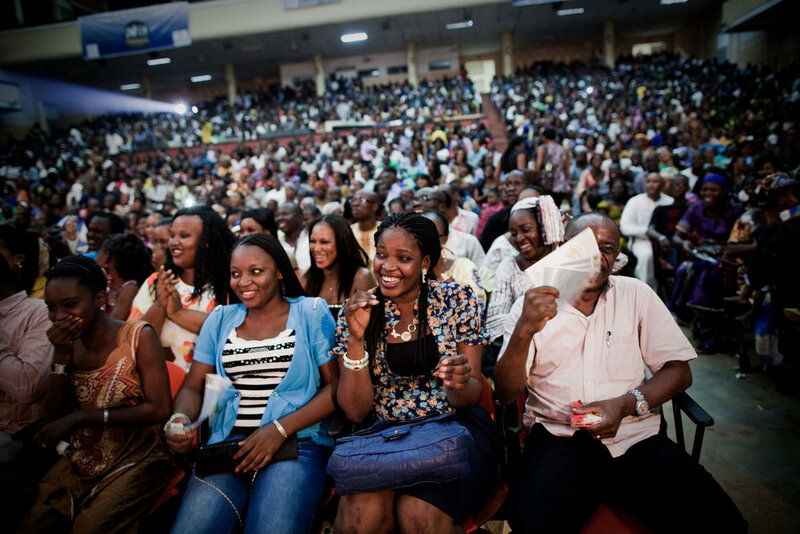 A large crowd of men and women at a comedy show in Bamako, Mali. Summary: Mali, a predominantly Muslim country, has been known for it�s vibrant culture, rich ancient Islamic history, religious tolerance and joyful music and dance. Yet much of this culture was at risk of permanent destruction when militant Islamist rebels took over Northern Mali in 2012. The rebels imposed their own despotic version of religious Islamic law and women bore the brunt of the crackdown. Many women fled, while some remained in the confines of their homes for over a year. In the spring of 2013 the French army entered Mali and defeated the Islamist militias. Photo by Katie Orlinsky. Bamako, Mali. OCTOBER 2013. The women's section of Friday prayers at the Grand Mosque in Bamako, Mali. Summary: Mali, a predominantly Muslim country, has been known for it�s vibrant culture, rich ancient Islamic history, religious tolerance and joyful music and dance. Yet much of this culture was at risk of permanent destruction when militant Islamist rebels took over Northern Mali in 2012. The rebels imposed their own despotic version of religious Islamic law and women bore the brunt of the crackdown. Many women fled, while some remained in the confines of their homes for over a year. In the spring of 2013 the French army entered Mali and defeated the Islamist militias. Photo by Katie Orlinsky. Bamako, Mali. OCTOBER 2013. A clothing store in Bamako, Mali. Summary: Mali, a predominantly Muslim country, has been known for it�s vibrant culture, rich ancient Islamic history, religious tolerance and joyful music and dance. Yet much of this culture was at risk of permanent destruction when militant Islamist rebels took over Northern Mali in 2012. The rebels imposed their own despotic version of religious Islamic law and women bore the brunt of the crackdown. Many women fled, while some remained in the confines of their homes for over a year. In the spring of 2013 the French army entered Mali and defeated the Islamist militias. Photo by Katie Orlinsky. Bamako, Mali. OCTOBER 2013. 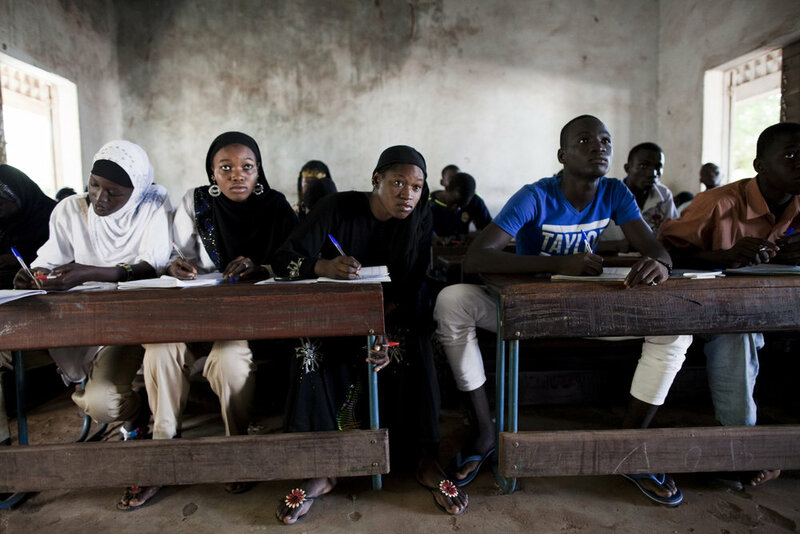 A co-ed Islamic school in Bamako, Mali. Summary: Mali, a predominantly Muslim country, has been known for it�s vibrant culture, rich ancient Islamic history, religious tolerance and joyful music and dance. Yet much of this culture was at risk of permanent destruction when militant Islamist rebels took over Northern Mali in 2012. The rebels imposed their own despotic version of religious Islamic law and women bore the brunt of the crackdown. Many women fled, while some remained in the confines of their homes for over a year. In the spring of 2013 the French army entered Mali and defeated the Islamist militias. Photo by Katie Orlinsky.